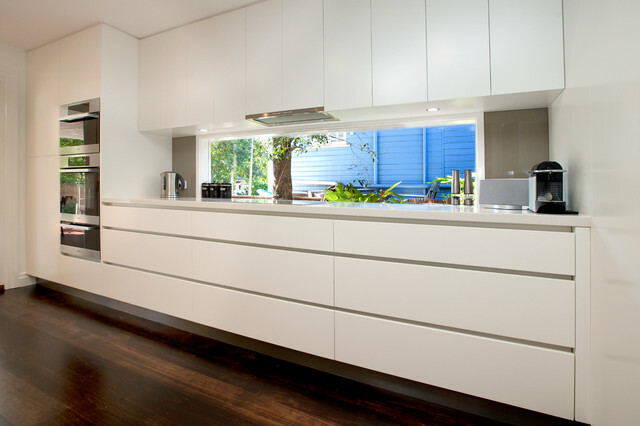 This contemporary ktichen in Graceville features a sleek and minamalist style with handle less cabinetry. 2pac cabientry and 40mm Caesar Stone benchtop with Glass splashback and Miele appliances and Blum hardware and storage solutions. This kitchen has ample storage with large wide drawers and overhead cabinets to the ceiling. Love the splash back - what colour is it? - Can you let us know the color of the splash back in this photo? Hi the splashback colour is Dulux Toffee Fingers. with a window in between the two pieces..